Outdoor work requires rugged, durable work footwear, like this pair of Chippewa Men's 20091 USA-Made Brown EH Steel Toe Boots. Chippewa first developed logger boots for lumberjacks of the great upper Midwest back in 1901. Today, these styles aren't just worn by the ... (see full details) (see specifications) #CHP20091. Outdoor work requires rugged, durable work footwear, like this pair of Chippewa Men's 20091 USA-Made Brown EH Steel Toe Boots. Chippewa first developed logger boots for lumberjacks of the great upper Midwest back in 1901. Today, these styles aren't just worn by the logging industry, but also by men who perceive this silhouette to be the ultimate in rugged, outdoor footwear. The uppers of these Chippewa boots is manufactured of chocolate brown apache leather, making these men's boots both durable and flexible. Less likely to change drastically in shape and flexibility over time, all-leather boots will provide long-lasting comfort. Apache leather has a high level of wax and oil applied during the tanning process. Oil-tanning makes the leather soft and flexible, so it requires less break-in time. This process also improves the leather's resistance to water, stains, and damage. Both the 5 iron Texon insoles and 4 iron Real Flex midsoles provide flexibility with every step you take. The material flexes as you walk to provide comfort when you're on your feet all day. Providing additional flexibility for your feet, there's also triple-ribbed steel shanks inside of these USA-made boots. It forces the appropriate break at the balls of your feet to help with arch support.Drill vamp lining inside the men's footwear will keep you cool and comfortable throughout your busy day. The cotton-type material pulls moisture away from your skin to help keep feet comfortable when temperatures rise and you start to sweat. On the bottom of these steel toe boots, you'll find a Vibram 109 logger outsoles. Vibram is the world leader in high-performance rubber soles and the brand is synonymous with quality, performance, safety, innovation, and design. The exclusive Vibram compound is highly resilient, durable, and guarantees maximum traction on wet/dry surfaces and various terrain. This compound will also maintain its physical properties, even in extreme temperatures. In addition, the lugs are angled to provide substantial edging capabilities, offering the traction you need on rugged terrain. Goodyear Welt construction was used to attach this soles to the uppers of these slip-resistant boots. The uppers are drawn over the last and held temporarily while the Welt is stitched to the uppers and inner soles. The soles of these EH boots are hand-stitched through the Welt to complete the process. Not only does this construction allow you to repair and resole your American-made boots, it also improves lateral support and stability. Leather Welts are very difficult to twist and this lateral support is especially important on uneven terrain. The leather expands and contracts with temperature changes, decreasing the potential of splitting or breaking and extending the life of the Chippewa footwear. When you're busy working you never know when an object can come crashing down on your feet. Compliant with the ASTM-rated protective toe classification, these safety toe boots can endure up to 75 lbs. of impact and 2500 pounds of compression. They'll also provide a secondary source of electric shock-resistance protection under dry conditions. EH-rated footwear is designed with special heels and sole materials to provide extra protection against accidental contact with live electrical circuits, electrically-energized conductors, parts or apparatus. Why not lace up a pair of Chippewa Men's 20091 USA-Made Steel Toe Logger EH Brown Boots before your next work day? The 8-inch height will provide strong ankle support, making them ideal for walking in rough terrain where steep climbs or descents are expected. If that's not enough, the antique brass, non-tarnishable hardware and heavy-duty, waxed Sta-tied laces add extra durability, holding up against the elements and your rugged lifestyle. My husband and I love the boots. He has been wearing Chippewa boots for a long time. 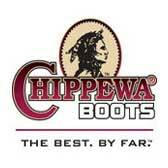 When he needs boot we can always count on Chippewa. My husband tells his friends about his boots and that they are very good product. I ordered these boots for my son. He loves the boots and wants to order another pair only a half size smaller. He says they are very comfortable and is wearing them for work every day. He especially liked the fact that they were made in the USA. We will be buying these boots again. Chippewa Boots: Men's Steel Toe 20091 EH USA-Made Logger Work Boots is being added to your cart.